The camp was carefully considered to ensure comfort and enjoyment for all visitors. The camp location is picturesque and hosts some of the areas best views, at the base of sandstone cliffs it been designed with the tents fanned out in a style that is similar to the unique formation of the main plaza in Jerash. There was careful consideration of the location of each tent, to ensure that they all individually offer views from the bed and an all around memorable experience for guests. 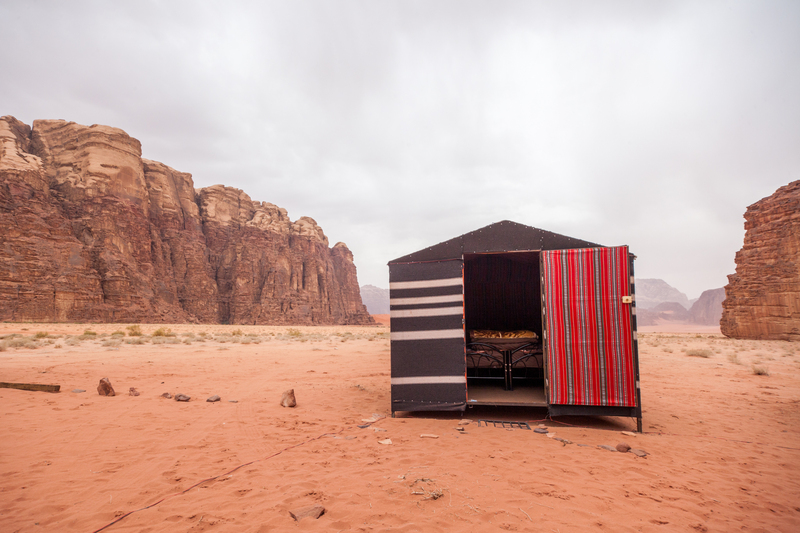 The tents are constructed with traditional Bedouin fabrics of the highest quality and care was taken in design and construction to ensure an exceptional cosmetic result. 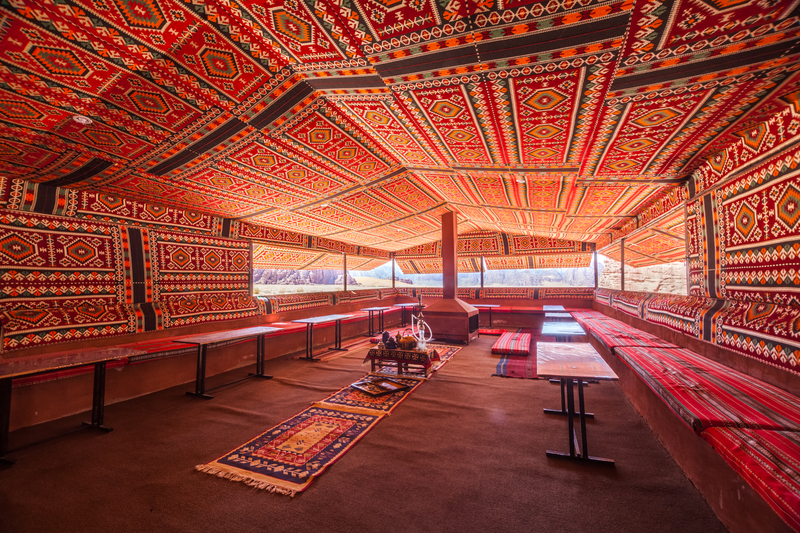 The outside of the tents are constructed with woven goats hair as is typical to the region and the inside is decorated with globally identifiable fabrics of Bedouin style patterns and colours. These fabrics have been used for centuries in the region and provide for a authentic as well as comfortable experience for visitors. The tents are raised from the ground to ensure cleanliness and maximum seperation from the elements, it also acts to promote air circulation around the tent in the warmest months. The goat wool fabric acts as a great insulator and the secondary internal fabric layer insures a barrier from the thick course material that absorbs most of the external climatic effects. 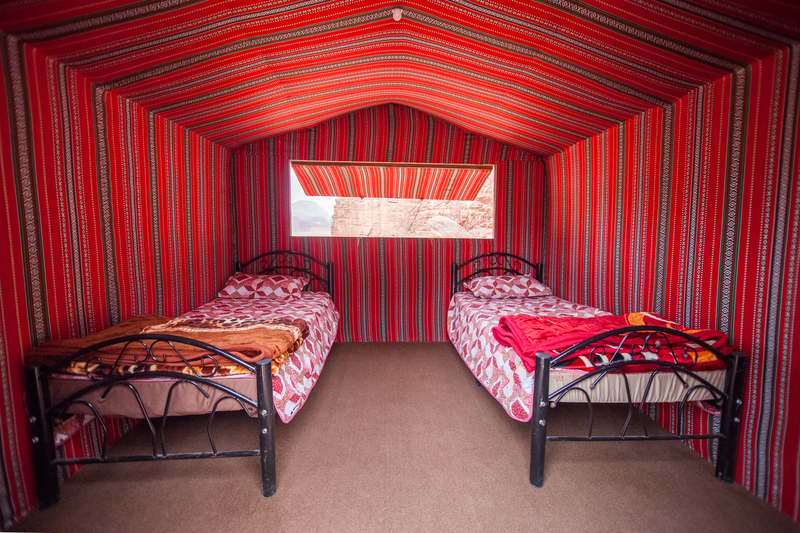 All tents have electricity and beds with linen, warm blankets for the cold desert night and pillows for all guests. Each tent is private and has different sleeping combinations to accomodate groups of different sizes. Visit and experience for yourself our superior offering. *Meals refers to breakfast and dinner for each night stayed. *Packages are offered for all guests who combine tours, accomodation and meals – refer to packages on website or make an enquiry through email.